Patients are dosed from the Dose Patient Form which can be accessed from various forms from within EasyDose or can be accessed from the Dosing drop down menu or the quick access menu. This form is the busiest and most complex form and is the absolute heart of the entire EasyDose program. EVERY FIELD is read only as this form acts as a conduit to most other forms and importantly, the Dosing Forms. This form is described in detail as it is important for each user to fully understand its functionality. This form closes, for privacy reasons, after two minutes of inactivity. Only active patients with a valid prescription and meeting the system option settings can be selected and viewed in the Dose Patient Form. If navigating from another form within EasyDose, the Dose Patient Form will open at that patient. If this form is opened directly from the quick access menu, the patient must be selected from the drop down list. 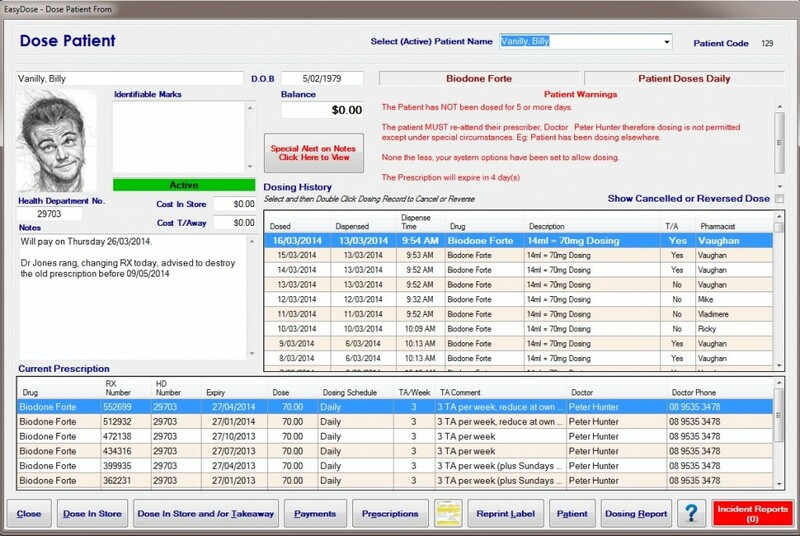 The patient list can be scrolled which will show each patient consecutively while scrolling the mouse. Note: Many events on this form are controlled from the System Options. When opened, the system options are checked. If any of the settings are contravened, warning messages appear. These warnings are in red text under Patient Warnings. Some settings trigger a warning but still allow the patient to be dosed. The corresponding Dose Patient buttons are then disabled. The Takeaway button is disabled if takeaways are not permitted. 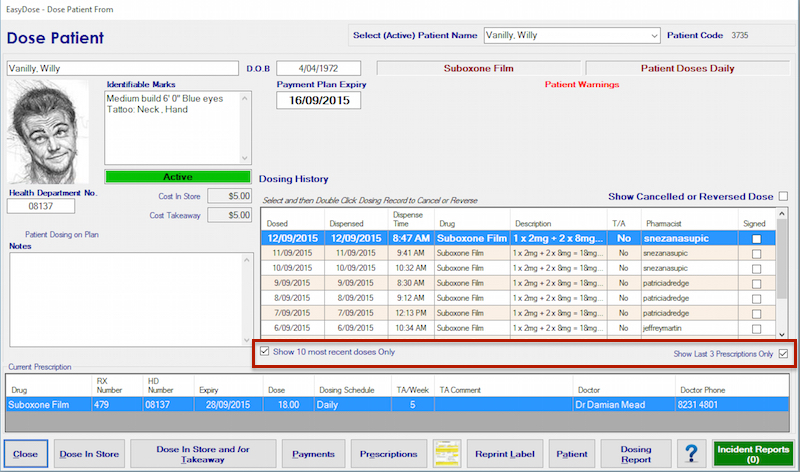 Relevant data from the Patient Details Form are displayed for each patient during dosing. Their photograph, if loaded in Patient Details, will show to assist with identity. Balance of payments (applicable only if the payment system is in use, set in Options) is always visible. Notes for this patient can be set to be highlighted each time the patient is dosed. The dosing drug and frequency are also listed for each patient. Their full dosing history is shown in table format. By default, the grid is displayed in Dosed Date (descending order). Click on any column in the grid will sort that column. Clicking that column again will reverse the order. Their full prescription history is also shown in table format. By default, the grid displays the prescription in order of entry (descending order). The last prescription entered is the one recognised by EasyDose. If the last prescription is expired and the system options are set to not dose if RX is expired, then the Dosing buttons will be inactive. If the daily dosing balance falls below zero ($0.00), the field will turn red to make it quite noticeable. (See below). If the system options have been set to “NOT allow dosing if unfinancial,” the system will not allow a patient to be dosed if they have insufficient funds to cover the cost of dosing. The Dosing buttons will be inactive. Notes against a patient can be highlighted as dosing is performed by placing a tick in the appropriate field in the Patient Details Form. 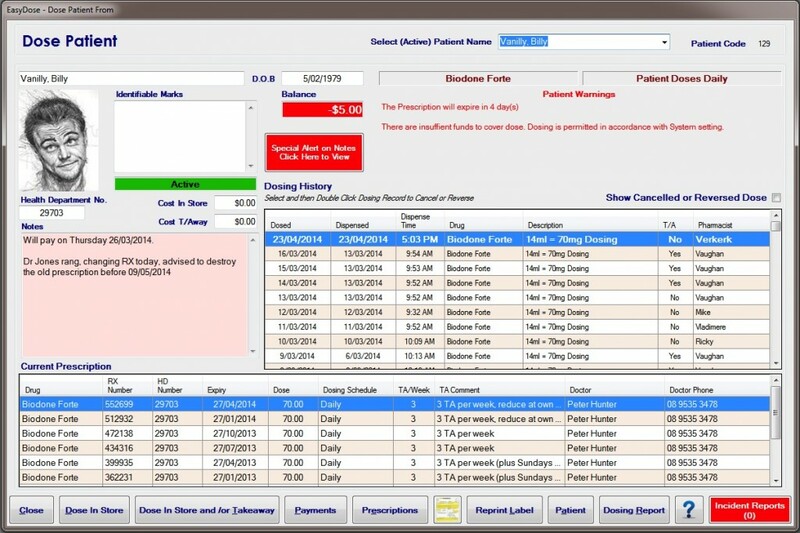 When the Dosing Form is opened for that patient, the “Special Alert On Notes – Click Here to View” button will show and flash red for 5 seconds. The notes field will change background colour for the same period. Clicking the button will open the notes in a separate form. Close – Closes the form and returns the user to the quick access menu. Dose In Store – Opens the Dose In Store Form (can only perform 1 dose in store). Dose In Store and/or Takeaway – Opens the Dose In Store and/or Takeaway (can perform 1 in store dose and up to 6 takeaway doses depending on the prescription). Payments – Opens the Payment Form for the current patient. Prescription – Opens the Prescription Form for the current patient. Rx/Script Icon – If no scanned prescription is loaded for the patient, the button displays the RX image, else it will show the scanned prescription. Reprint Label – Allows for labels to be reprinted (type of label controlled by Label Options). Patient – Opens the Patient Details Form for the current patient. Dosing Report – Opens the report in print preview.
? Opens the website at this page. If green, indicates no Incident Reports recorded against this patient. If red, there are Incident Reports listed against the patient and the number of reports. The latest changes include the ability to restrict the number of historical dosing records and prescription records are displayed to assist in the speed of opening the form. Removing the tick from the respective boxes will display all the applicable records.